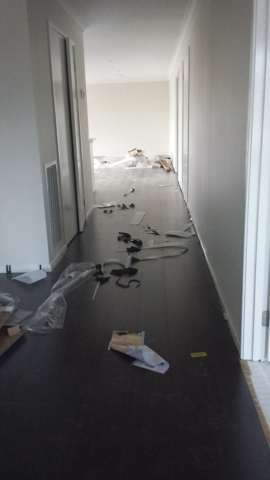 Our Lindeman 28: A quick flooring update! After a 2 week delay in having our flooring laid its almost complete! We went and had a look last night and this is what we found! I'm totally in love with it!! They had done the majority of it and just needed to finish the butlers pantry and dining area off! This photo was taken through the front window, so it's a bit blurry. Our temp fencing came down yesterday and this morning there was a bobcat there cleaning up the site! The carpet will be laid tomorrow which I'm really apprehensive about and wishing that we had of paid extra to upgrade. We are resigned to the fact that it probably won't be what we want but will wait and see, we may be pleasantly surprised! If not, we have friends who own a carpet store so they may be getting some business from us in a year or so! My little guy is sick at the moment, so I best go and tend to him now!